Intel recently conducted and released a new report titled, "The State of Data Center Management as a Service in 2018." The data in this report reflects insights from over 200 IT directors and managers, IT system administrators, and application architects in both the U.S. and U.K. To discuss the report's findings in-depth and learn more about the benefits of a data center management as a service (DMaaS) solution, I reached out to Jeff Klaus, GM of Intel Data Center Management Solutions. VMblog: Intel recently released a new survey - what does the survey cover and why did you choose this topic? Jeff Klaus: This survey focuses on the emergence of Data Center Management as a Service (DMaaS) and the void it fills in the data canter management industry. With today's IT professionals feeling the pressure of continuous power consumption monitoring, disaster recovery preparation, ongoing health checks and much more, DMaaS provides an easy-to-use, low cost cloud-based solution that helps monitor data center infrastructure incrementally, receive real-time insights, and prevent potential failures. VMblog: What interested you the most about the findings and why? Klaus: What I find to be the most telling result of the survey is the number of technologies deployed by organizations that may provide some overlapping capabilities - not to mention across various teams - to gain the insights necessary to meet today's IT environment needs. This coupled with the level of satisfaction respondents indicated with their current capabilities shows the importance of a DMaaS solution to centralize data center management. VMblog: The survey reports that over half of the respondents (59%) signaled they still struggle with varied technologies that hinder their data management strategy. Where do you think the current solutions are failing and how is the industry working to fix this? Klaus: In addition to the push to expand or implement new offerings, this data point signals that organizations are faced with the burden of various tools that aren't working together to provide what's necessary. In many cases, current solutions do not provide a holistic view of data center operations and as the industry continues to grow, these frustrations continue to elevate. New technologies like DMaaS are empowering IT managers and directors to receive increased visibility into their data center environment without the burden of high costs and a challenging learning curve. As a result, IT professionals will have the ability to monitor their data center infrastructure incrementally, receive real-time insights, and prevent potential failures. VMblog: With 36% of organizations using 'a combination of automated solutions plus manual processes' for data center management, it's obvious there's a lack of knowledge about DMaaS solutions. Why should the industry be interested in learning more about DMaaS? Klaus: DMaaS offers organizations a streamlined approach to pulling actionable insights from large sets of customer data. This solution maximizes cloud capabilities by managing mass amounts of data while integrating machine learning features that produce holistic, actionable analytics. As these data sets grow and mature, there is an opportunity to enhance predictive features that will provide IT professionals with the ability to forecast any future maintenance. We see this reflected in the survey with over 50% of respondents seeing value in a DMaaS solution's ability to strengthen their colocation strategy through rapid and secure scalability, 24/7 remote data center monitoring, and immediate access to the IT ecosystem. VMblog: What do you think will be the driving forces that push DMaaS to the front of market? Klaus: While innovation in this space is still in its early phases, it's evident that DMaaS offers a less costly, more simplified approach to data center management that the market is demanding. IT professionals are warming up to the benefits of a shared cloud environment as their need for operational efficiency and real-time data-driven insights grows, pushing the industry closer to leveraging the benefits a technology like DMaaS can provide. 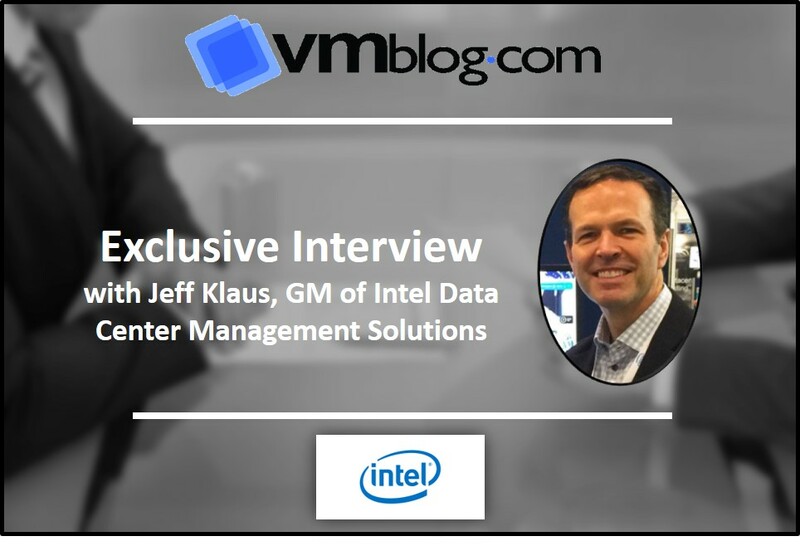 As General Manager of Intel® Data Center Management Solutions, Jeff Klaus leads a global team that designs, builds, sells and supports Data Center Management software solutions through an extensive distribution network. Since joining Intel in 2000, Klaus built and maintains the largest global ecosystem of middleware solutions through Server Hardware OEMs, Software Infrastructure Management Providers and Cloud Service Providers. As a leader in the Data Center infrastructure industry, his group is responsible for Intel® Virtual Gateway, Intel® Rack Scale Design Manager, Intel® Resource Management Solutions and Intel® Data Center Manager (DCM), the only software that provides real-time, server-level telemetry data and power management across a wide range of data center servers and IT devices. An active member within the Software Defined Solutions space, Klaus serves on the Board of Directors for the Green IT Council and has presented multiple keynotes at leading industry conferences, including Gartner Data Center, AFCOM's Data Center World, the Green IT Symposium, and the Green Gov Conference. As a thought leader within the DCIM community Klaus regularly contributes articles on key data center topics and trends in Forbes, DataCenter Dynamics, Mission Critical, Data Center Post, IT Business Edge, Data Center Knowledge, Information Management and Data Centre Management.